The Christian Science religion started by Mary Baker Eddy in Boston is of fairly recent origin. The official founding of the church as we know it today was in 1892. In 1894, the “Mother Church,” designed by noted Chicago architect Solomon S. Beman, was built in Boston. The Quad City area was on the leading edge of Christian Science growth, and the Rock Island church was actually an offshoot of a congregation in Davenport. In autumn of 1895, the Rock Island contingent began meeting here for Friday evening services because of the difficulty crossing the river twice a week. These midweek sessions were first held in the Industrial Home Building, also called the Labor Temple, at 3rd Avenue and 21st Street . Then, for a short time, they used the Swedish Baptist church on the northeast corner of 5th Avenue and 21st Street. Meetings were also held in Mr. and Mrs. Charles Mixter’s home, which still stands at 754 23rd Street. It was at one of those meetings, in early 1896, that the decision was made to form a separate Rock Island congregation and to build their own church at 829 23rd Street. The spot may have been selected because many of the members, including the Mixters, Denkmanns and Kohns, lived within walking distance. 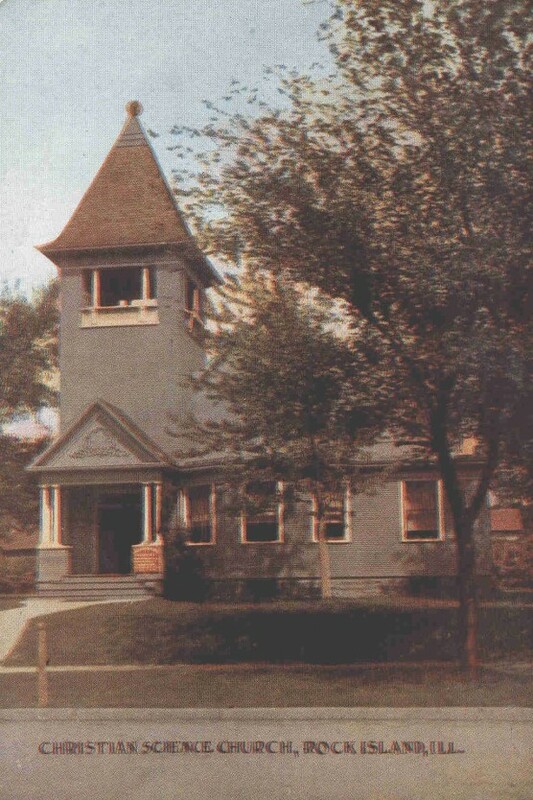 The new church, completed in time for dedication on November 8, 1896, is shown on this postcard. It had the distinction of being the first Christian Science Church in the state of Illinois. The postcard shows that the scale and massing of the church fit well into its dignified residential neighborhood. It was a single tall story, 18 feet high to the eaves, covered in narrow clapboard, with a three-storey bell tower with an open colonnade at the third floor level. It was set back from the curb the same distance as adjacent homes – and, strange by today’s standards, there’s no huge parking lot surrounding it! The design owes a great deal to the typical house plan of the era, even including a columned open front porch beneath the bell tower. Applied wreath-and-ribbon decoration on the porch gable is similar to trim on neighborhood homes. Even the window configuration that features a large center front bay would not be out of place on a house. The Gothic shaped muntins in the upper sashes of the bay held clear glass panels, while upper level windows — not visible on the postcard — had leaded art glass. The Christian Science congregation prospered. In 1914, a new church was built on the corner of 7th Avenue and 22nd Street. It still stands today, now adapted for use by the Karpeles Manuscript Museum. When the new church was occupied, the old one was demolished and the land sold. It ended up in the hands of Frank P. Welch who had purchased the large shingle and clapboard home next door at 817 23rd Street a few years earlier. Frank’s daughter, Helen, recalled that the church’s art glass windows were broken out so the lead they contained could be used for shot during World War I.
Frank Welch and his brother James were the original owners of Illinois Oil Products, which they founded in 1908, to sell oil, grease and kerosene directly to consumers. As the company and the Welchs prospered, Frank purchased the house which had been built about 1897, and began to remodel it to suit his prominent position. He first built a large three story structure, which held autos on the ground level and provided a servants apartment above. The third level, a sleeping porch with screens on all four sides to catch any breeze, was connected to the main house by an elevated walkway. After he acquired the former Christian Science land in 1921, he expanded a bay on the south of the house on all three levels. At the same time, he enlarged the original small porch on the northwest corner to create a spacious wraparound that could be entered from the bay addition. The final touch was landscaping the new side yard. It was magnificent, complete with a heron fountain in the center of a circular concrete pond, sited where the church had been. Surrounding the Welch estate on three sides was a massive 8-foot high iron fence that was reportedly made by Illinois Oil Company employees in their barrel and steel products plant. A rock-faced concrete block wall ensured privacy on the alley side. The Welch home was converted to six apartments during the World War II years, but it never suffered the indignity of inappropriate siding or torn-off porches. Although in rough condition, it was architecturally intact and, after restoration and renovation, is once again a single family dwelling, complete with its iron fence. The house is also distinguished by being a designated Rock Island landmark, formally recognized by the Rock Island Preservation Commission for its association with an important person, Frank P. Welch, as well as for its significant and distinctive architecture. But the old Christian Science church is still a presence on the Welch estate: During dry summer weather when the grass browns, the ghost of the church foundation is once again visible, precisely asserting itself in the side yard. This article, by Diane Oestreich, is slightly modified from the original which appeared in the Rock Island Argus and Moline Dispatch on August 7, 2005.